"A proven track record of over a thousand players and teams from all over the USA". Our mission is to promote the best international soccer experience for players and coaches with the highest standards of quality, integrity and friendliness. Teams from all over the United States - Clubs and Schools, as well as Olympic Development and Collegiate Teams - Have discovered the world of international sportsmanship through Brazil Pro Soccer School. The Brazil Professional Soccer School invites you to participate in our Training Program in Brazil. You will have a great opportunity to participate in clinics and games in professional soccer clubs. This experience will be great for future references to play soccer at higher levels in high schools and colleges, and can ever help higher your chances in getting scholarships for college. Brasil has won five world cup championships, produces many famous soccer players every year. By training in Brazil you will learn many Brazilian tactics & techniques. 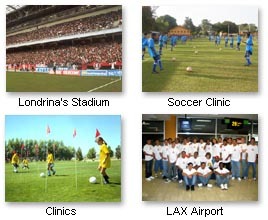 Players will be taught various styles with an emphasis on the Brazilian Style of play. Brazil has won five World Championships and the clinics are modeled after national team training practices - soccer is a passion and a part of everyday life. Hundreds of soccer teams at all levels of competition are awaiting your team in our beautiful and peaceful country.